"Argent, on a chevron between two couple closes indented sable three escallops or impaling, Or semy of flowers gentle, in the middle of the chief a sengrene resting upon the heads of two serpents in pale, their tails knit together, all in proper colour, resting upon a square marble stone vert, between their breasts a book sable garnished gules, buckles or; all within a bordure compony argent and sable." A Flickr photo shows additional details: http://www.flickr.com/photos/johnlinwood/3163751034/, put up by John Linwood on 3 Jan 2009. Caius arms, 1561: http://www.cai.cam.ac.uk/rota.php?count=3. Gonville and Caius large arms (clickable, too): http://en.wikipedia.org/wiki/File:Caius_College_Crest.svg. The "couple closes" are thin chevrons, usually accompanying a normal one; a sengrene is a plant, a kind of leek. For a special case see the sledging flag at http://www.antarctic-circle.org/E16.htm: [Antarctic explorer] "Wilson's flag hangs in Gloucester Cathedral (…). 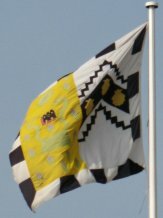 I thought it was at his Cambridge college, Gonville & Caius, but going there last October and seeing the flag in the dining hall, it was clear that this was the college flag which Wilson took south with him (…) and not his sledging flag. It's mounted on the wall beside the high table, protected by a covering." The colors of Gonville and Caius College are given as black and pale blue, not taken from the arms.